Perfect for brides, bridesmaid, host and other formal occasions. 1.Perfect for brides, bridesmaid, host and other formal occasions. 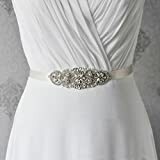 2.The bridal sash can decorate your wedding dress or formal dress. 3.The sash looks elegant and can reflect your own style.